Experience the wonder that is the CELLO! 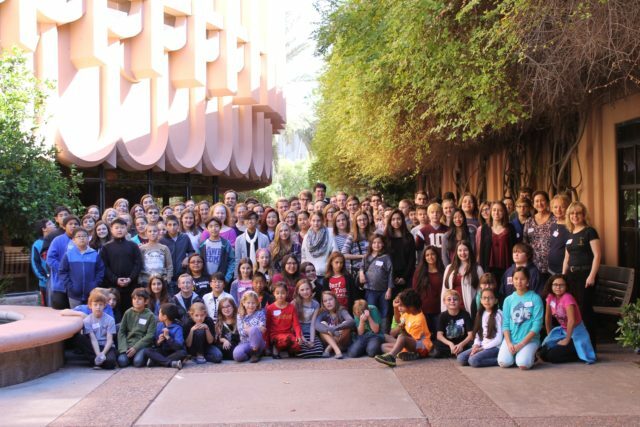 Cellists of all levels are invited to join us for a day which explores the enormous range and the fun of the cello in a Grande Cello Orchestra (new this year) as well as the leveled ensembles, while working with some of Arizona’s finest and most experienced university, public school, and studio cello teachers. Enjoy meeting new people who share your love of the bass clef! And for those advanced players – we have plenty of tenor and treble to satisfy your quest for the higher stratospheres!!! Sign up by October 23rd and you’ll be able to order a Cellobration T-shirt! General Classes2: A fun day of CELLO for all levels – Beginner (Level 1) through Advanced (Level 5). Check-in and Registration begins at 9:45am. Classes begin at 10:15am. Music (including music for Cellobration’s Grande Cello Orchestra) and other materials will be provided in advance via email so that students feel prepared to enjoy the day to its fullest. Thomas Landschoot, Cello Professor at ASU, will teach level 4 and 5 students. Students in Levels 4 & 5 are encouraged to bring solos and other music they are working on. **Concert Performance: All cellists will be learning cello ensemble music in their respective classes and will perform them onstage in a free concert before an audience of family and friends. Thomas Landschoot and ASU cellists will also perform on this concert. The concert will conclude with ALL PARTICIPANTS performing in Cellobration’s Grande Cello Orchestra! Cellobration T-Shirts available through pre-order sale/registration only (deadline 10/23/18). Teachers: Certification Verification will be available for any teacher who attends any of the classes. Pre-registration is recommended; there is no registration charge for teachers. Parents: Parents are welcome to observe the class their young cellist is attending. Level 2: Cellists with a firm understanding of 1st position, with extensions on all strings. Must read music. Level 3: Cellists with a firm understanding of the notes in half through 4th positions (with extensions). Play in keys through 3-sharps and 2-flats. Level 4: Cellists with a firm understanding of half through 7th positions (thumb position). Play in keys through 4-sharps and 4-flats. Knows tenor clef. Uses vibrato. Please note: Students may be reassigned to a different level based on our teachers’ assessment to ensure that they will have the most enjoyable experience possible.